Excessive underarm sweating is a problem that affects at least 3% of the global population. The medical term is Hyperhidrosis and Axillary Hyperhidrosis refers to excess sweating under the arms. What can Cure Hyperhidrosis & Excessive Sweating? There have been several treatments in Ireland over the years to treat hyperhidrosis, the main ones being surgical correction by interruption of a nerve chain to more recently chemical treatment using botulinum toxin. Botox for excess sweating is performed by doctors and can treat underarm sweating very effectively with just a few injections required under each arm which results in little to no sweating. The injections under the arm are placed in your sweat glands. When the Botox takes effect it stops the muscles that squeeze sweat from the sweat glands to the surface of the skin. This results in effective reduction of sweating under the arms. There are about 10 injections required under each arm for best results. How long does Botox for Sweating take? There are 10 injections needed under each arm and the whole process takes about 5 minutes to perform. The treatment ‘kicks in’ over the course of 10-14 days and results last from 4-8 months but the average is 6 months. Will I Sweat Somewhere Else Instead? This is one of the most common questions about botox for excessive sweating. You’ll be happy to hear that there is no evidence of compensatory sweating in other areas! Is it Natural to use Botox to stop Underarm Sweating? A lot of people wonder is it unnatural to use botox to reduce sweating? ‘Surely your body is supposed to sweat?’ they ask. And they are correct, you are supposed to sweat, it is a healthy and natural way to excrete waste and to regulate temperature. However there are some people who through a quirk of nature sweat more than is absolutely necessary to serve these functions. In these cases the problems of body odour and the social embarrassment stemming from sweaty armpits can be resolved by using botox for underarm sweating. Who gets Botox for Underarm Sweating? Botox for underarm sweating is typically a treatment done for those who have long suffered with excessive sweating. Occasionally it is for someone who through their work or through a big event want to reduce their sweating. For example those who have a wedding and don’t want to sweat through their wedding or bridesmaid dress will often get some botox for underarm sweating. Also those who work in sales or have business meetings and find that the stress of such meetings results in sweating through their shirts like to get it done. Such people find improvements in their sales and business when they sweat less, as they look and feel more confident. I had botox for underarm sweating recently. I have performed this treatment hundreds of times for others but never had it myself. I usually wear a white shirt but found that these shirts weren’t lasting very long, after a month or two a shirt that would be worn for a few hours at most would end up having sweat stains under the arms and was pretty much unwearable. Using Botox resulted in a marked reduction in sweating and shirts passing the ‘smell test’ where they would previously fail! Please feel free to ask any questions you have about botox for underarm sweating or hyperhidrosis below and I’d be happy to answer them! 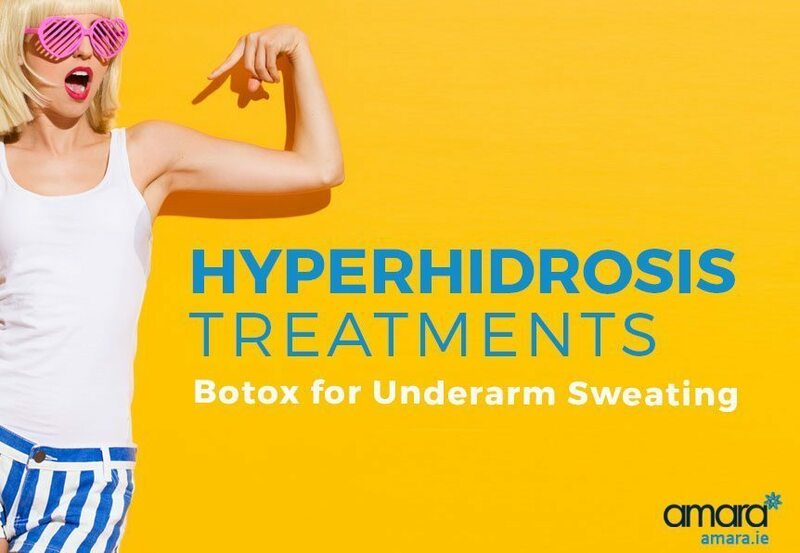 If you want to book in for a consultation to improve your underarm sweating then get in touch! Hello, inwoukd like to make an appointment. Hi Elaine, Please fill out a contact form on the side of any page with your details and we will be in touch. The cost is €700 which covers both underarms (axillas) and includes a review appointment where top up may be performed at no cost. Results are very patient dependent but can be expected for 5-9 months. This consistently ranks highest on our patient treatment satisfaction charts.